A high quality thatch roof that has been correctly installed to a high standard using quality materials can last many many years. Thatches that are not exposed to extreme conditions on a regular occurance can have a long life span depending on the type of thatch that has been used. 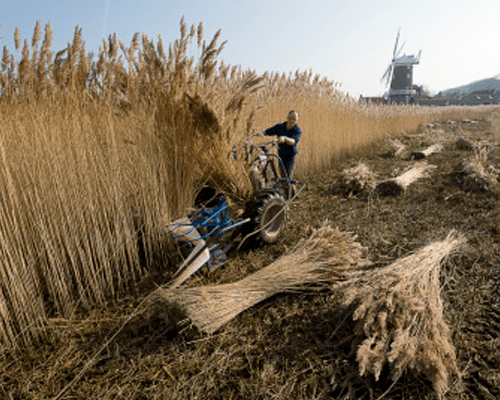 As a rough guide Water reed thatches can last 50-60 years, Combed wheat 20-40 years and Long straw 20-25 years. A good level of maintenance can ensure that you get the best life span from your roof. There are several factors that can effect your roofs condition. How effectively your roof sheds water is important, shallower pitch roofs tend to retain a higher level of moisture which accelerates decay. Other factors that can shorten a thatches life span include houses in regions where there is a high level of humidity where moisture can build up and don’t allow the reed to dry out enough on a regular basis. Also areas where houses are exposed to strong wind conditions can also have adverse effects on a thatches longevity. Materials as with all products contribute to a roof’s quality. The better the quality of materials then the higher the quality of the whole roof and of course the most important factor is the Master Thatcher doing the work. Ensure that your thatch roof is inspected regularly and maintained by an approved and experienced thatcher. When considering any work to a thatch roof it is first important to have a full evaluation by a Master Thatcher who will be able to determine the type of work required. General repairs are relatively straight forward and can often be started without too many issues. If however a the property requires a total re-thatching with many thatched properties they may be a listed property and consent to replace the roof will be required. The property owner will be required to record evidence of the original work & technique used in the original roof before any removal has taken place. A thatch roof deteriorates gradually over a period of time leading the original thatch loosens slightly from its fixings. This can be knocked back in to place evened up across the whole roof and then secured back to its original fixings. This process is called Dressing Up. Again over the thatch’s life time material often becomes loose, this material can retain moisture which can eventually spread and damage the body of the thatch. This loose material can be brushed off and removed, this process is called Brushing Down. Hole damage. Wind can cause damage which tends to cause small recesses in the roof. These small areas can often be repaired provided they are not associated to any major underlying problems such as slippage. Undertaking any work on a thatch roof is a major process and it’s essential that you choose a Master Thatcher who’s work you can be sure will be of a high quality. Dodson Thatchers have a long and established history of excellent workmanship exceeding 90yrs of the family run business. Clive Dodson has personally worked on over 1000 thatched properties over the past 40 years and are proud members of the Master Thatchers Association who’s link can be found on our home page if you wish to contact them and check our credentials. The cost of thatch repairs or replacement can vary greatly depending on many factors which need to be considered. When estimating the cost of a thatch repair or replacement it may not always be possible to determine the condition of the existing roof timbers or all of the existing thatch. Be wary of off the cuff estimates or over the phone quotes. All of our quotes will be written and all work outlined with notes outlining costs of any associated timber work along with additional costings for extra work. If you have any questions or would like to discuss any of your thatching issues please don’t hesitate to contact us on our office number at 01487 710520 or on mobile 07860 288542. Master thatchers & experts in every aspect of thatched roof's. If your unsure of the condition of your thatch we can asses it with a free expert un-biased consultation from Clive Dodson. 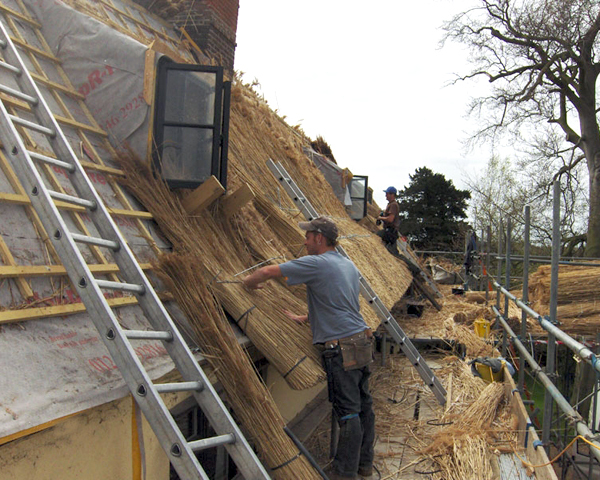 A Master Thatcher with over 45 years experience overseeing the repair & renovation of over 1000 thatched properties. Copyright © 2019 Clive Dodson Master Thatchers. All Rights Reserved.